Having technical problem in downloading the e-ADMITCARD ? 1. Check the e-Admit Card carefully and bring discrepancies, if any, to the notice of the UPSC immediately. 2. Mention your name, Roll Number, Registration ID and Name & Year of the Examination in all the correspondences with the UPSC. 3. Bring this e-Admit Card in each session to secure admission to Examination Venue. e-Admit Card may be preserved till the declaration of final result. 4. You are responsible for safe custody of the e-Admit Card and in the event of any other person using this e-Admit Card, the onus lies on you to prove that you have not used the service of any impersonator. 5. Please read the Examination Notice available on the UPSC website www.upsc.gov.in and “poster containing instruction displayed outside the Examination Hall. 6. No admission of candidates to the examination lab will be allowed after the Entry Gate Closing Time as indicated in the e-Admit Card. 7. You are required to record your boimetric attendance on reporting at the examination lab. 8. Your candidature to the Examination is provisional. 9. Candidates who do not have clear photograph on the e-Admit Card will have to bring a photo identity proof viz Aadhaar Card, Driving License, Passport, Voter I Card etc. and two passport size photographs one for each session for appearing in the Examination with an undertaking. 10. Candidates are advised not to bring any valuables/costly items to the Examination Venue, as safe keeping of the same cannot be assured. The Commission will not be responsible for any loss in this regard. 11. Candidates are advised to visit their Examination Venue at least one day in advance and familiarize themselves with the itinerary to avoid the last minute problems in their own interest. They should reach the Examination Venue on the day of Examination well in time as frisking prior to entry into examination venue is an essential requirement. 12. Candidates should note that they shall not be allowed to appear at any other Examination Venue except the Examination Venue mentioned in the e-Admit Card. 13. Candidate should not be in possession of or using any mobile phone( even in switched off mode), pager or any electronic equipment or programmable device or storage media like pen drive, smart watches, etc,. or camera or Bluetooth devices or any other equipment or related accessories either in working or switched off mode capable of being used as a communication device during the examination. Any infringement of these instructions shall entail disciplinary action including ban from future Exanimation. 14. There will be penalty (Negative Marking) for wrong answers marked by a candidate. The candidates applying for the examination should ensure that they fulfil all eligibility conditions for admission to the Examination. Their admission at all the stages of the examination will be purely provisional subject to satisfying the prescribed eligibility conditions. Mere issue of e-Admit Card to the candidate will not imply that his candidature has been finally cleared by the Commission. Verification of eligibility conditions with reference to original documents is taken up only after the candidate has qualified for Interview/Personality Test. Candidates are required to apply online by using the website www.upsconline.nic.in Brief instructions for filling up the online Application Form have been given in the Appendix-II. Detailed instructions are available on the above mentioned website. The online Applications can be filled upto 25th May, 2018 till 6.00 P.M. The eligible candidates shall be issued an e-Admit Card three weeks before the commencement of the examination. 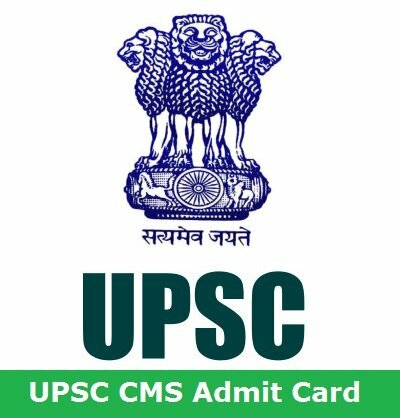 The e-Admit Card will be made available in the UPSC website [www.upsc.gov.in] for downloading by candidates. No Admit Card will be sent by post. All the applicants are required to provide valid and active E-mail i.d. while filling up Online Application form as the Commission may use electronic mode for contacting them. Candidates should note that there will be penalty (Negative Marking) for wrong answers marked by a candidate in the Objective Type Question Papers. The written examination for Combined Medical Service for two objective papers will be conducted in Computer based mode. A demo module for Computer based mode of this examination will be available on UPSC website www.upsc.gov.in at the time of the launching of e-Admit Card. In case of any guidance/information/clarification regarding their applications, candidature etc. candidates can contact UPSC’s Facilitation Counter near Gate ‘C’ of its campus in person or over Telephone No.011-23385271/011-23381125/011-23098543 on working days between 10:00 hrs and 17:00 hrs. (a) Mobiles phones, Bluetooth or any other communication devices are not allowed inside the premises where the examination is being conducted. Any infringement of these instructions shall entail disciplinary action including ban from future examinations. (b) Candidates are advised in their own interest not to bring any of the banned items including mobile phones/pagers or any valuable/costly items to the venue of the examination, as arrangements for safekeeping cannot be assured. Commission will not be responsible for any loss in this regard. On the basis of the results of the written part of the CISF AC (Exe) Limited Departmental Competitive Exam, 2019 held by UPSC on 03.03.2019, the candidates with the under mentioned roll numbers have qualified provisionally for Physical Standards/Physical Efficiency Tests and Medical Standards Tests.